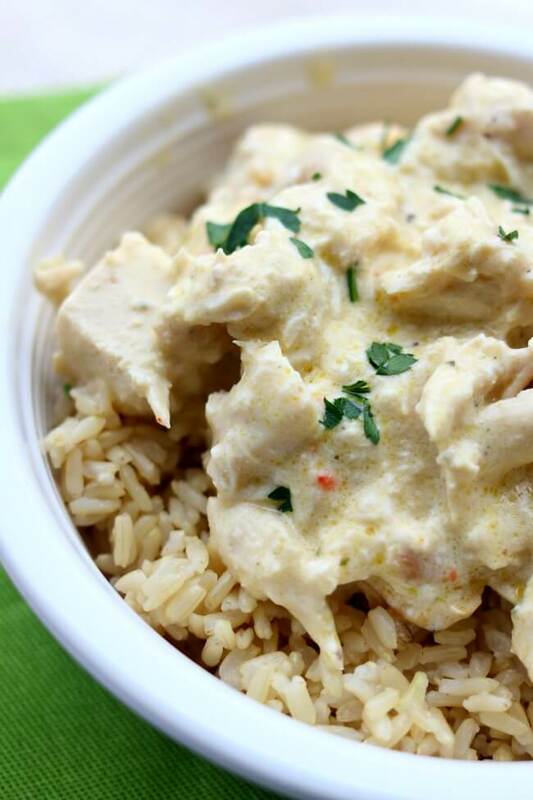 Slow Cooker Creamy Chicken: the easiest cheater recipe out there. Chicken, cream cheese, cream of chicken soup and an Italian dressing mix packet are combined to make a delicious chicken and rice dinner with hardly any work. 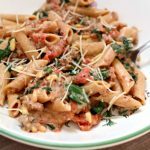 This recipe is the very first recipe that I knew how to make in my slow cooker. I received my slow cooker as a wedding gift and didn’t really understand what it was for or how to use it. My sister, Gina, invited me for a Sunday dinner once and served this delicious chicken and rice. I took that recipe and made it in my own slow cooker every now and then. Other than that the slow cooker was stored on the shelf with very little use. That was until I started this blog! Now I’m of course using the slow cooker all the time. 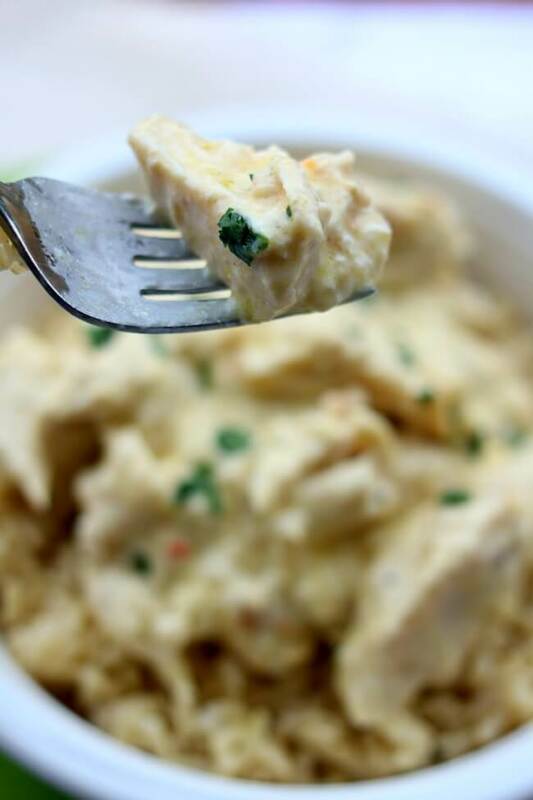 Even though I now have hundreds of slow cooker recipes up my sleeve this easy cheater slow cooker creamy chicken remains a keeper! The easiest cheater recipe out there. 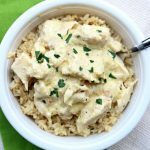 Chicken, cream cheese, cream of chicken soup and an Italian dressing mix packet are combined to make a delicious chicken and rice dinner with hardly any work. 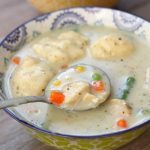 Place chicken, butter, dry italian dressing mix and cream of chicken soup in the slow cooker. Cover the slow cooker and cook on low for 2-6 hours (the fuller your slow cooker is the longer it will take to cook. If you have a large slow cooker with hardly any chicken in it it will cook in 2 hours, if you have a crockpot filled to the brim it will take 6 hours). Remove the lid and stir. Break up the chicken with a fork or knife (or you can leave the chicken in large pieces, it’s up to you). Cut the cream cheese into cubes and stir it into the slow cooker. Let the cream cheese melt for about 10 minutes and then stir again until it’s creamy. Serve chicken and sauce over rice. If you want to stretch this meal out further you can add an additional can of cream of chicken soup. If the sauce is too thick you can thin it out with a cup of chicken broth. 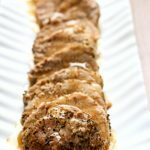 You can use frozen chicken breasts for this recipe. Just add 1 1/2 hours of cooking time. 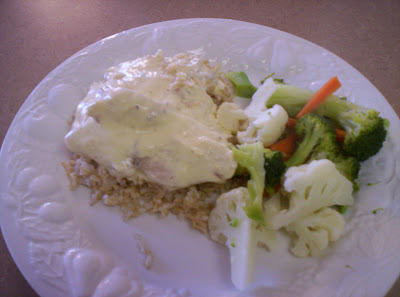 This is the original picture that I took of slow cooker creamy chicken on day 28 of my slow cooker journey. 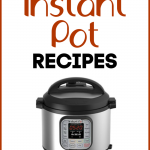 Any chance this is instant pot converted? I haven’t liked the way things turn out using my ip as a slow cooker and I don’t have a reg. slow cooker. Just curious. 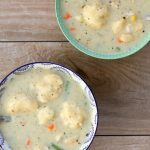 Thank you for all your recipes, I make several, weekly. What size package of cream cheese – the 8 o one or smaller? Made this for dinner tonight and thought it was delicious! It'll definitely make the rotation! Love, love, love it! Shredded the chicken and used heavy cream instead of the soup. (One of my kiddos is gluten intolerant. Gluten is in nearly every soup on the shelf.) And a bit of cornstarch to thicken. So good I will make it over and over. Found you through whateverrecipes….JMHW above. I made this tonight for dinner and it was a hit! I added the soup and cream cheese before cooking and skipped the butter, but I’m sure it’s very similar. Definitely 5 stars!!! The leftovers are possibly even better! I LOVE your blog! We have made this dish twice now. It has become a family favorite. I like it better with the chicken shredded. I also have added sour cream. Thanks for doing this blog! I made this yesterday for dinner and it was a huge hit. The kiddies (ages 14 months and 4 yr-old) inhaled it and the hubby gave it good reviews too. 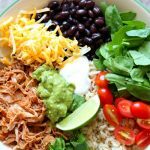 I used bone in thighs and legs stripped of skin and then shredded it and it was awesome! Thanks for the tasty addition to our dinner list. We made this last night for dinner and it was a HUGE success!!! Everyone in the house loved it!!! Thanks for the wonderful recipes, please keep the coming, it is making cooking more exciting. I have a recipe very similar to this. It’s SOOOO tasty! Definitely worth making! When I make this, I sometimes just use Italian dressing and chicken breasts. After those are done, I shred the chicken and add the cream cheese and chicken soup and also frozen peas and let that cook for a while longer. Then I serve it over noodles or rice or toast. It’s so good.